Scabvent Soap is a potent insecticide that kills, itchmite causing scabies ad lice infestations of Head,Body and Pubic area. 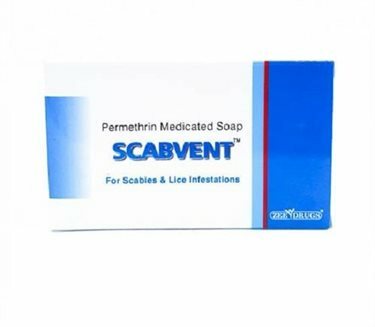 Scabvent Soap contains Permethrin, which completely eliminates parasites. Composition- Permethrin 1 %W/W, Soap base q.s. Direction for use- Wet the affected area, massage Scabvent Soap liberally to make rich lather, Leave for few minutes and rinse thoroughly. Avoid contact with eyes.